Off-road safety tips should always be followed when heading into the wilderness or off the beaten path. First, lets explain what an offroad vehicle would be considered, then we’ll get into the off-road safety tips. Motorcycle or any related 2, 3, or 4 wheeled vehicle. An (All-terrain vehicle) ATV which is a 3, 4, or 6 wheeled vehicle. The tires will have low pressure and be designed for use on off-road. Multi-wheel or multi-track drive vehicles. Dirt bikes and dune buggies. There are times when speed is required to drive up a hill or conquer an obstacle. Nevertheless, you may not make it if the obstacle may require 10mph or more. With this in mind you may get stuck or ruin something. It is advisable to drive on paths that were previously used. This way you will know that there is a possibility of making it through the path and you will also reduce chances of damaging the environment. If you try to use your own path you will not only leave ruts that will remain for a long time, but you will also get stuck. However, simply because another individual successfully used a trail, it is not a guarantee that you will too. They could have been trained better, they may be having better skills or they be possessing a better vehicle. There is a low chance of your vehicle making it through the trail if you can’t walk through it on foot. 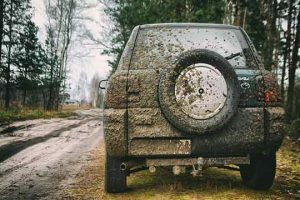 If you are uncertain about the condition of sand, mud and other hindrances on foot, walk through it first because if you cannot make through it on foot, there is a high probability of your vehicle not making it too. Routes covered in water should be thoroughly checked first to avoid sinking. You can’t be certain whether there is a huge pot hole hiding in the trail or not, unless you had seen another vehicle passes through it. When you aren’t sure about an obstacle, never tackle it unless you are capable of walking back to get help. Unless you made prior arrangements, there will be nobody to call if network coverage isnt good. If you wave at an SUV driver, he may not be willing to help, the farmer who owns the tractor may be away from home and the tow-truck driver will not leave the pavement. In case you get lost, if you had told somebody where you’re going, and when to be expected back, it will be easy to locate you for the person will know where and when to start searching.